Monday 15th June 2009, Jim was out walking his dog when who did he meet up with? the other Whisky Boy Dougie, who was out walking his own dog and his daughters dog. We got talking about this and that and it was at this point Dougie asked me if I was doing anything in particular tonight, of which my answer was “no”. Without hesitation Dougie suggested to Jim that if he called around to Dougies house there may be a wee tasting or two interlaced with the odd game of pool. So after a quick tea with Jacqueline, Jim packed his bag with his accoutrements and a couple bottles of beer and made his way around to Dougie’s. As expected Dougie had the tasting table all set up, with glasses, water and oatcakes, what a joy to see. Clan Denny Vatted Malt Scotch Whisky from Islay. Jon, Mark and Robbo’s Malt Scotch Whisky – The Rich Spicy One. Earlier bottles of Clan Denny-Islay only had a blend of four Islay Single Malts, Caol-Ila, Laphroaig, Bunnahabhain and Bowmore. 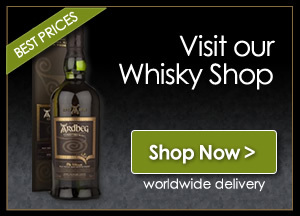 But Dougie’s bottle is a more recent blend and now has five Islay Single Malts in its blend, the four mentioned above plus the addition of Ardbeg. So as you know Jim and Dougie are great lovers of all things Islay and were looking forward to this one. Nose…Huge phenolic smokiness with a large wave of sea spray. Taste…Oily, iodine and smoke with lots of sea salt tingling on the tongue. Finish… Medium length leaving iodine and sea salt. Nose…Intense, iodine and seaweed, a little smoke in the background, no peat showing here. 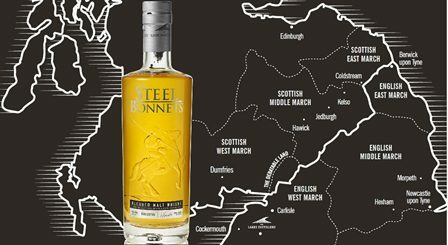 Taste…The smoke is not hiding any more, sweet and oily, no doubting this ones Islay parentage. Finish…Not too long, oily smoke and sweet, with a little salt on the lips. This was a fabulous wee dram we can only congratulate Douglas Laing and Co for this little gem of a Whisky, Dougie commented that we must look out for the other Clan Denny Blend I.E. The Speyside. We also agreed that we should now try and include more of the Douglas Laing products in future tastings, always easier said than done, so much to get through. The second of Dougie’s Double Whammy night was the Rich Spicy One. A wee note to remember, this nip is only sold in 50cl size bottles. Here are a few notes about the lads that created this exceptional dram. Starting with an Idea on a hillside followed by a spirited conversation one night David “Robbo” a “master” distiller and the brothers Jon and Mark both “master” whisky drinkers agreed that their world needed a whisky that tasted exactly the way they liked and cut out all the waffle that always seemed to go along with whisky. Mark set Robbo quite a challenge on this one. Create a whisky that tastes like two of his existing favourites, Macallan Gran Reserva and ESC 1 (ironically, Robbo’s babies from his previous job). Jim and Dougie could hardly contain themselves, it was expected to be a gem of a wee dram, the Boys were not disappointed, read on. Nose…What aroma’s, unbelievable, rich dried sultanas, apricots and orange with sweet cinnamon and cloves. Taste…Rich (what else can I say) with a complex sweet, yet nippy/ spicy /salty tang, an exciting overload of flavours. don’t try anything else afterwards. Finish…Long, a medicinal dry smoky pepperiness, what a dram this is. Nose…Heavy on rich fruit and sherry and sweet spices. My nose has just had an overdose of sensational smells, fantastic. Taste…So big – so warm – so long – so rich – so fruity – a toffee apple chewiness. Does what it says on the bottle. Finish…Rich and long a hint of peat way in the background, and absolute delight of a dram. Well what can I say, Dougie this was a great tasting session. Maybe you should be honoured in the Queens Birthday Honours List, for services to the Whisky Boys. Not only was this a quite unexpected tasting session but what about ther aroma’s and flavours that were dished up here. Once again Dougie a great wee night. For the pool players who read our articles, we played two games honours even on the evening. You know that we keep saying after a tasting for you to go out and buy the dram just tasted, but on this occasion it’s a must, one bottle of each that we tasted tonight, be prepared to be blown away by the smells and flavours. Thanks to Jon, Mark and Robbo, you have produced something exceptional here, very well done, and thanks again. Remember when buy your bottles tell them the Whisky Boys sent you.